COLUMBIA, Mo 12/5/17 (Beat Byte) -- Third Ward Columbia City Councilman Karl Skala Monday night cast the deciding vote to approve multi-million dollar property and sales tax breaks for a downtown hotel developer. With accumulated interest and other costs, Broadway Hotel developer Dave Parmley will receive over $4 million in so-called Tax Increment Financing (TIF) to expand his existing hotel, 4th Ward Councilman Ian Thomas -- one of only two no-votes -- explained. 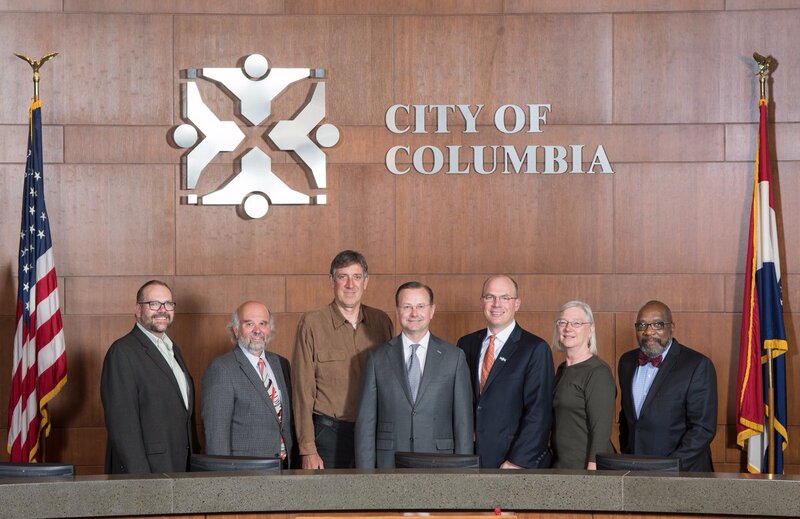 Skala joined four other Council members (photo) rebuffing recommendations against the project from the Columbia School Board, TIF Commission, Library Board, and Tribune editorial staff. The twenty three year incentive package abates property taxes and channels fifty percent of sales taxes toward the hotel's first TIF, a three million dollar incentive passed in 2011. Local TIF incentives had been restricted to historic preservation projects such as the Tiger Hotel and gateway redevelopments such as the first Broadway Hotel, which demolished the aging and unsafe Regency Hotel. But the Council's five-to-two approval sets a new precedent. After paying one million dollars for the expansion site, Parmley, with lawyer Robert Hollis, argued the location "could become blighted," citing "dog excrement," "deleterious land layout," spent condoms, and a small existing structure "that's been vacant for twelve years." "Yes, there's dog excrement," Hollis said, referencing the PowerPoint slide below (click to enlarge). Mayor Brian Treece cast the only other no-vote, citing concerns that Parmley wasn't finished asking for taxpayer help. A "funding gap" between loans, the TIF, and investor contributions may necessitate Parmley establish a so-called Community Improvement District (CID) that could levy its own taxes. After Hollis presented slides explaining his interpretation of state TIF statutes, Treece also worried the project did not meet the legal criteria, sparking one unusual exchange when Hollis said Treece misquoted Parmley from a televised interview. "I have the video," Treece said. "Maybe you've been drinking," Hollis replied, calling his comment a joke. Hired to analyze the project, former deputy city manager Tony St. Romaine took a seat with city staff as a city employee. Over forty five minutes of testimony, St. Romaine promoted Parmley's "passionate feelings for this project," his "vision for downtown," and the project's many merits. "The city bears no financial risk," St. Romaine repeatedly emphasized. Public testimony carried the evening. Only one audience member -- TIF Commissioner John Clark -- testified against the project, while twenty or so mostly Parmley employees and downtown business people testified for it. Former Councilman John John scolded Council members, comparing the downturn in student housing to estimates of the hotel expansion's economic benefits. "Over the last year, I hear nothing from you guys except we need more money, we need more taxes, we need more income," John said, raising his voice. "You're talking about going to the voters to ask for more taxes. But you're gonna turn down fifteen million dollars in revenue? If you wanna convince voters, you gotta prove you can count!" First Ward Councilman Clyde Ruffin and Sixth Ward Councilwoman Betsy Peters voted in favor. Peters said she had heard enough to prove Parmley met legal criteria for the huge tax breaks. Ruffin said he saw the hotel expansion as a source of jobs and prosperity. "This project has compelled me to think about the future," Ruffin explained. "I know I have an opportunity now to make a difference." As the last to vote, Skala -- who frequently says he opposes developer tax incentives -- cast the deciding ballot, telling the audience his mind would probably not be made up until he heard the other votes.